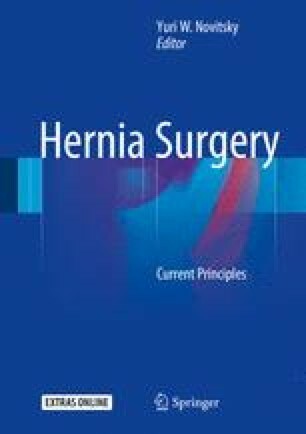 While laparoscopic ventral hernia repair (LVHR) has been shown to provide a safe method of hernia repair with reduced wound morbidity when compared to open repair, laparoscopic closure of the hernia defect remains a debated topic. Instead of bridging the defect as with traditional LVHR, defect closure aims to reapproximate the linea alba, thus creating a more functional abdominal wall by medializing the rectus muscles. In addition to eliminating the need to bridge defects, closure offers the advantages of smaller mesh use, obliteration of the dead space resulting in reduced seromas and mesh exposure, as well as reducing subjective postoperative bulging. While laparoscopic closure of abdominal wall defects has increased in popularity, there is a continued need for randomized trials to truly demonstrate long-term durability and advantages over traditional bridged LVHR. The online version of this chapter (doi: 10.1007/978-3-319-27470-6_22) contains supplementary material, which is available to authorized users.